I recently planned a party I couldn’t attend and hoped it would turn out all right. My mom now lives in a nursing facility, and I couldn’t travel the two hours to see her on her birthday due to another commitment, so I made a plan. 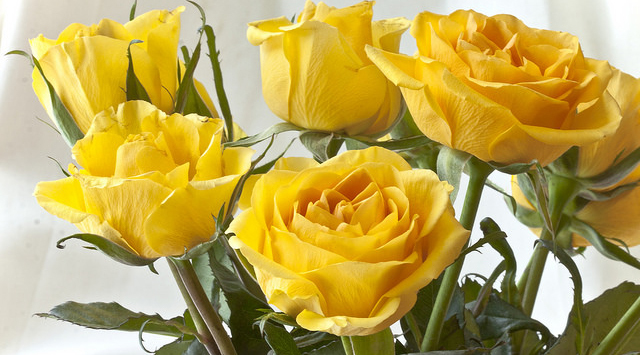 I asked my dad to buy 12 yellow, long-stemmed roses and leave them at the nurses’ station near Mom’s room at the home on the morning of her birthday. Then, I called 12 of Mom’s friends and asked each of them to stop in during the day at an assigned time, picking up a rose from the nurses’ station and delivering it down the hall to Mom. There were several reasons for this: 1) I wanted Mom to have a fun birthday, 2) some of these ladies didn’t even know Mom was in the nursing home, it was their day to be informed, and 3) I was hoping it would “break the ice” for some to come back for more visits. A priest asked David in 1 Samuel 21:1 “Why are you alone? Why is no one with you?” There are days—moments in our lives—when it just isn’t any fun to be alone. An elderly mother turning over another calendar page with “birthday” marked on it is one of those days. Two of the “rose deliverers” already made a trip back to see Mom. I think her birthday party turned out just right. Image: Yellow Bouquet (cropped) by Flickr user Liz West licensed under CC by 2.0.